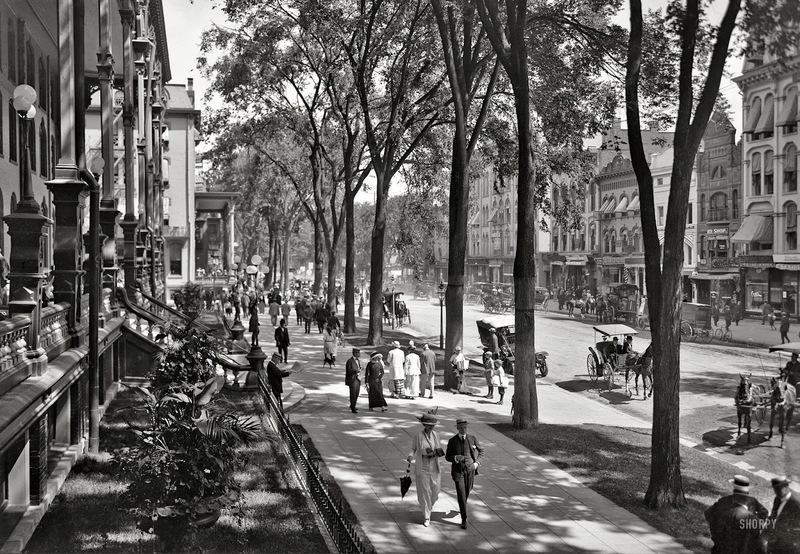 Peak time for Saratoga Springs back in its' heyday, was summer. Late summer - August - Racing Season, to be exact. Before it's fame as a racing hub, it was the center of shady coolness, just south of the Adirondacks in north New York State, and the home of some mineral springs that had been used as medicine since before the white man. Rich Europeans and Americans would flock to Saratoga Springs in the summer months to cool off and to escape the mosquito born illnesses in warmer parts of the country, not that the people of that time knew they were mosquito born. The huge Elm trees that shaded the streets of the city and the breath of refreshing, clear, sharp air from the mountains just to the north carried the promise of health in the midst of the dog days of summer. That coupled with the mineral waters and baths and medical treatments centered around Saratoga Spa made this town a draw for all those rich enough to afford to change locations for long periods of time. This is where my great great grandfather, Nelson Bootier (Narcisse Boutin in Quebec) came to live in the mid 1800's from Quebec, Canada. He was a carpenter, played piano and sang, and his brother, Ezra, who also came, was a tin smith. I'm old enough to remember some of the remaining impossibly tall elms along the street in front of my grandparent's house on 84 White Street. The Dutch Elm blight that arrived in this country from imported timber in 1928 and carried by bark beetles hadn't yet arrived and done its' damage in the picture copied from Shorpy.com below (the link opens up at the Shorpy site, so scroll down to see the picture here). No matter how hot the day, under the spreading high branches of the Elms and the giant fir trees, the air was cool. My father was born in 1919 and this is the town he remembered as a small child. He went to school here, went to war from here, and returned in 1945. I don't like to think about post war Saratoga Springs, or any of the other major cities in the US. Everything changed after the war. Urban renewal tore down many historic structures that, arguably, were falling down areas of poverty. But history was erased so fast and so freely at that time, in the name of modernity, the city of tomorrow, etc., that one of the major hotels in Saratoga Springs that had operated for over 100 years at least, the United States Hotel, was torn down in perfectly good working order, it's furniture sold off, and I believe an A&P grocery store and parking lot was put in its' place. You can see the magnificence of the United States Hotel before it was demolished by watching the movie, "Saratoga Trunk", an Edna Ferber novel made into a movie in the 40's with Ingrid Bergman and Gary Cooper. I'm not positive, but the giant hotel on the left of the picture may be the United States Hotel. 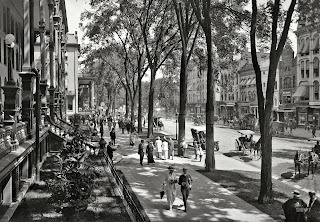 There are the famous elms, this is Broadway, the main artery of Saratoga Springs and where the best hotels were. Perhaps one of my ancestors is a newsboy in the picture. I wish I could walk right into the picture and explore. The umbrella is the only somewhat encumbering item of her outfit, and perhaps it is scheduled to rain later that day, or she protects her skin from the sun, even in these northern climes. She has on a simple white (remember - NEVER after Labor Day...) straight skirt that looks to be of cool material - linen? Next is a simple shirtwaist, tucked into the skirt with a nice narrow frilled collar, not fussy at all. The thick belt and what looks like a few flowers plucked from some arrangement (perhaps in her room at the hotel) and placed in it for decoration show her whimsy and enjoyment of her surroundings. The pendant hanging from the one dark string of beads is perhaps a locket of some kind and the beads are in sharp contrast to the white on white outfit. The light jacket tops off the skirt and seems to be somewhat tailored, rather than a boxy look. She is carrying a small purse or book, I can't tell which, and her hat is the only point of contention to me. I believe the decoration on the back is made to look like a bird's wing, and on the side may just be the real wing of a now dead bird - definite points OFF for that. My favorite - her shoes. They look somewhat akin to today's comfortable sneaker type walking shoes, but dressier, as fits the time period. I know nothing about men's suits, but I assume her companion is dressed to the nines for their morning promenade, and they look like a very interesting couple. Not every gentleman in the picture has on a jacket AND a buttoned vest with tie tucked in, so I assume he is quite stylish. No children to care for, they look carefree. Notice the short pants. My dad wore those as a child. These children are probably local resident's children, maybe even Bootiers trying to make some dough. On the lower right, tipped up against the tree, is a chair containing someone I assume to be another newsboy by the jaunty angle of the chair legs. His mother probably never let him do that at home! The lady on the left with the tight buttoned down dark jacket and skirt - serviceable wear, but unattractive (I have a picture of my grandmother from about the same year and she has on a dark wool suit that looks heavy, but warm, for winter, and decidedly plain). Her hat is approved though, because there were no birds harmed in its' creation. The hat and shoes are the only white parts of her apparel. She looks proper, but uncomfortable, and she is smoothing the bottom of her jacket. It doesn't look like she can get enough breath in that thing, and she probably has the inevitable corset below it all. Her companion isn't nearly as dapper as the gent in the front of the pic. And he has a stogie hanging out of his mouth. I know that was considered stylish, but he just looks like a trombone salesman on vacation with his very self conscious wife. The two elderly women and the man look like summer vacationers in comfortable wear, but the long white jacket looks like a box over the striped skirt, and the next woman's suit looks like so many of the outfits one sees in pictures from this time period. Unlike the trombone salesman, they look like they are undoubtedly rich and enjoying their racing season and their morning walk. The hat on the boxy woman's head is the best hat in the picture, and the hat of the suited woman should be minus the white standing up thingy. They are very proper however, very proper. At first I thought it was a real child in the shadows, but then I saw the other lamps further down. Beautiful and so ornate. Last is across the street. Except for the cigar store and the "Busch Beer on tap", the rest of the shops look inviting. The Ice Cream and Confectionary store sounds divine. Once again, shades of "The Music Man" with Marion, the Librarian having a strawberry phosphate at the River City Ice Cream shop. Oh how I would love to go into some of those stores. I bet the ice cream was delicious, but in New England (which Saratoga Springs isn't precisely in, but it might as well be), it seems it is the best ice cream in the world. Also, note the big horse-drawn wagon with the loads of luggage in it. They must be delivering to one of the large hotels from the railroad station.